Around my house, waffles for dinner is a huge hit! I had a bunch of blackberries (grown organically in my backyard) in my freezer. I decided that instead of blueberries, blackberries would make delicious waffles. 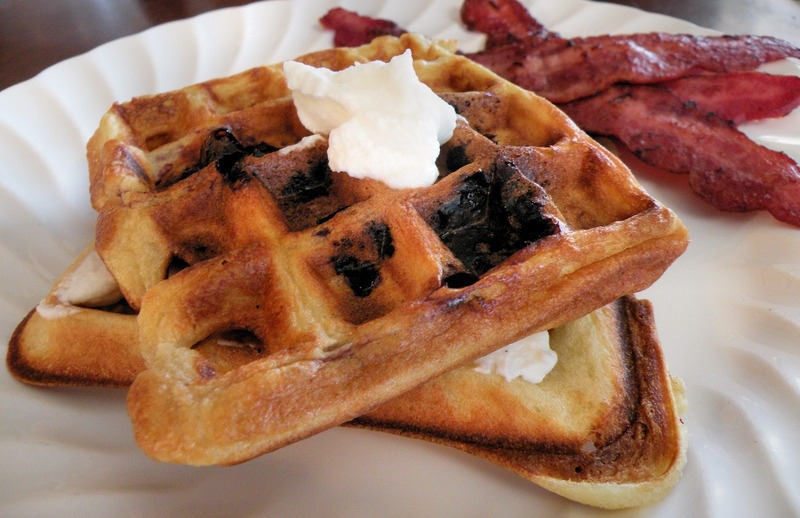 Then I took it a step further and decided that in lieu of the standard recipe, I would make buttermilk waffles. My daughter loved them so much that she declared them to be, "the best waffles she's ever eaten," and she at twice as many as she normally would. I'd say that this recipe was a success! It's a pretty standard, buttermilk waffle recipe from my BHG cookbook, with the addition of the blackberries and quick butter. Combine dry ingredients thoroughly in a medium to large mixing bowl. Make a well in the center. In a separate, small bowl, whisk together the wet ingredients. Add wet ingredients all at once to the "well" in the flour mixture and stir just until ingredients are incorporated, there should be some lumps. Cook in your waffle maker according to its normal directions. Since all waffle makers are different, yours probably does not cook the same as mine. This is not a replacement for the butter that you buy at the store. My daughter did this project at school and was so excited about it that she wanted to do it at home with me. It is a very simple process and yields a very tasty product. Pour heavy whipping cream into a container that has a tight fitting lid. I would not recommend more than 1 cup at a time. Shake vigorously until the cream thickens into butter. For 1 cup of cream it took us about 15 minutes. It really is that simple! This does not work well in recipes, but to top bread, toast, waffles, pancakes etc it is VERY yummy!